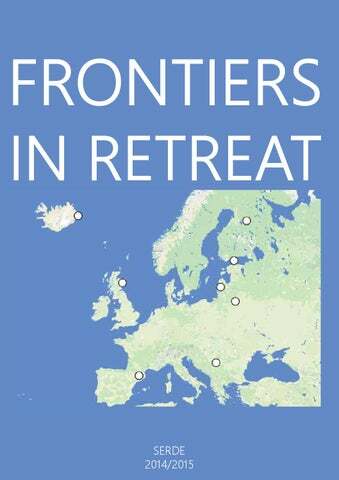 Frontiers in Retreat is a five-year collaboration project that fosters multidisciplinary dialogue on ecological questions within a European network formed around artist residencies. The project sets out to examine processes of change in particular, sensitive ecological contexts within Europe, to reflect them in relation to each other and to develop new approaches to the urgencies posed by them. Moreover, the project recognises the necessity of multidisciplinary approaches to the current ecological concerns and aims to develop means and platforms for this through methods of contemporary art. The project is coordinated by HIAP – Helsinki International Artist Programme with the support of the Culture Programme of the European Union. The project connects artist residency centres located in “remote” areas across Europe in order to provide a unique, transnational platform for investigating local and global ecological concerns. Frontiers in Retreat is realised by seven artist residency organisations in Finland, Iceland, Scotland, Latvia, Serbia, and Spain in collaboration with a Lithuanian art organisation that will develop the educational program of the project. The core of the project is formed by research and production residencies. 25 European artists representing different cultures, generations and artistic approaches have been selected collaboratively by the project partners to develop new art works in response to the different ecological contexts of each residency site. During the coming years, the artists will circulate within the residency network and conduct artistic research driven by the particular ecologies of the sites. This project is focused on research and raise awareness of the relationship between art and ecology. Here I developed the following projects. The third project was located in the St. John Lutheran church, but I didn’t have permission to develop it. All the trees I met. II The work is a continuation of exploration with trees I started in Farrera in 2012 and continued in Java. Was performed on the Apple-ing Festival, with the collaboration of the musician Ruta Vitkauskaite. What an intimate connection can be established between a tree and a person. What an example of health, strength, about what life is and how symbols are hidden in them. From the first day in Aizpute I was captivated from the trees, and specially with you. Very close to SERDE you welcomed me. Your sensual forms captivate me and, at the same time, I feel you big and strong and full of life. Horizontal branches of selfish beech, stretching majestically drinking light. Every day I come to your daily life. Children going quickly to school, women going shopping, some drunk, some distracted dog and the leaves. How many generations wished to climb you! From the second day I couldn’t resist to discover your body. The diameter of your strong branches allows me to feel safe and moving every day for your light relief. I explore you and I see that you are man and woman at the same time and I like that. Complete, holistic. You excite me, welcome me and swing me. The moss that you nourish, dress you with a dark and soft green. It’s a dress custom made just for you. I'll be another ant again, coming up, a ripe fruit, and now also a lover. Fagus, faig, dižskabārdis... Stairs and Water. It was an improvisation work coming from the ideas of Amerta Movement. Listening the place for 22 days and exploring my presence inside its presence. This work was showed the 26th of September and still in process. I found this place on the second day. Some mysticism, wind, trees and water. These stairs remind me of old structures, of access to a temple. As if they wanted to transport me up to the sky and down again toward the lake… Reminding me of the circularity of life. Suddenly, I realise how much the water is present in this place, in this town. I feel the moisture on my feet, mouth, in my bones and heart. Nature is so strong, water is so strong! The green invading and gaining ground against grey human constructions. Hopeful smile. Meanwhile, invading new areas of grey, nature begins its slow and patient attack in other places. Like this moss on the stairs and the leaves that are right now falling. Gints Gabrāns (LV) http://www.gabrans.com “Metabolic Dominance” In 2004, the US Defense Department’ s Defense Advanced Research Projects Agency announced a competition with the aim of providing soldiers with the means of carrying out battle operations and relocating without food stores. Under the project “Metabolic Dominance” we offered genetically modified human ingestion system bacteria, which synthesize cellulose disintegrating enzymes. Cellulose is a simply sugar glucose polymer. It forms any plant cell walls. Such cellulose disintegrating enzymes would give soldiers the chance to obtain nutrients from any available plants and timber, or else, in circumstances of urban warfare, from paper. For example, it if proves possible to create a full cellulose disintegration process, 11% more kilocalories can be obtained from 100 g of paper (which contains cellulose) than from 100 g of bread (400 and 355 kcal respectively). We have already created the first bacteria of this type. Outside the human body (G.G. ), bifidobacteria from its ingestion systems were genetically modified, giving them the ability to synthesis cellulose disintegrating enzymes. This was done, in collaboration with the microbiologist Jānis Liepiņš and the company GenScript (www.genscript.com). In order to prevent genetically modified bacteria from coming into contact with a soldier’s body, it is planned that biocapsules will be used which have developed by Dr. David Loftus Medical Director, NASA Ames Research Center, and which could be custom-adapted for the requirements of this project. Dr. Loftus was created the biocapsules so that transgenic organisms do not come into contact with the organism of an astronaut, and so that their synthesized molecules to protect astronauts from radiation. Biocapsules are made from composite carbon fiber, which is sufficiently dense to hold comparatively large synthetic organisms in the capsule, but also to be permeated by many smaller therapeutic molecules – in the case of our project, cellulose disintegrating enzymes synthesized by transgenic bifidobacteria. “PostFOOOD” UN estimates that by 2050 the number of world’s population will reach 9 billion, therefore it will be necessary to produce by 70 per cent more food. Thus instead of producing greater amounts of food the project offers other solutions and studies the interaction of these new ideas with culture, environment and human. The project Foood is based on the human’s (G.G.) genetic modification of metabolic bifidobacteria outside the body giving them the ability to synthesise an enzyme that can break down cellulose. Cellulose forms the cell walls of all plants. For the human metabolism, the indigestible cellulose cell wall reduces the nutritional energy value of food. Cellulose is glucose polymer of ordinary sugar. These cellulolytic enzymes would allow humans to make a third more efficient use of food from the plant world – potatoes, carrots, cabbage etc. that contain a significant amount of material that is indigestible by humans . They would also allow the more efficient use of completely new types of food resources even, for example, cellulose containing wood and paper. Joanes Simon Perret (FR) http://joanes-simon-perret.wix.com/art Growing textile Growing textile is an installation about 4 cities where I have spend time. Riga LV and Marseille FR, Aizpute LV, city where is SERDE residency and Montmeyrant FR the city where I was born. Riga and Marseille was both European Capital of Culture (2014 and 2013), They have aproximatly the same amound of population and the same size, but whene you look at the satelite view of these two cities you can easly notice how diferent are the spaces dedicate to the vegetation. Marseille have an high density of buildings and you can notice that the most of green spaces are some small private gardens hide from the street by a fence or a wall. There are also some small public parks. In Riga you can find some wastelands with will plants and they are open on the street, some large public parks, and also some grasse's space betwene the road and the pavement. If you compare Aizpute to Montmeyrant you can easly notice that the way of agriculture is very diferent. Around Montmeyrant you find some very geometricale fields separate by few trees, and almost no forest. Near Aizpute fields have a more organic shape, they are also some small forests and lakes all over. From these observations I created a four parts installation where each one is an allegory of a city. On one side there is an handcraft weaving textile with also some other objects insert in (branchs, grasse, leaves, plastic bags and also other object associated to these cities). In plus there is some seeds introduce into weavings. The weaving associated to "Riga" have been weaved by Riga's citizen themself during an open workshop. The second side of each part is made with some obects that remenber my these cities: local brand advertising, postcards, toy cars giants flowers, piece of wood and all kind of objects found around. I put some seeds everywhere into the installation that grown thanks to an automatic watering systeme. The wartering systeme build with some randome plastic bottles, second hand pipes... it runs five minutes every hours and transforme the installations in a funny fountain. Durring 2 months plants grown, bloom and died through textiles and objects, changing slowly the installation. Matisa Tirgus Little Model The "galas paviljons" of Matissa Tirgus is an unused building since several years. Gradually the walls crashed, the roof leaks, the windows fall. Looking closely, I see that more than 20 species of plants were installed in the building. Mosses, grasses, youngs threes are growing on the walls and cracks of the building. Nature begins to reassert itself over the city. So I decided to build this model of "Galas Pavijons" with brittle materials such as cardboard, paper, and install some seeds of different species. The quick growth of the plants transform the model and change the time and sizes scalls. The bean plant which is grown in a week becomes a three through a roof and cress seeds become bushes. Through this installation, the slow movement of nature is recreated in accelerated and invites us to ask ourselves about the place that we give to plants in our life. Joanes Simon Perret (FR) http://joanes-simon-perret.wix.com/art "Human interventions vs natural landscape" For this time in SERDE's residency I focused on the human intervention on the natural landscapes. I looked at the Latvian countryside and I noticed how close to the nature is still this culture. Many peoples are growing their own vegetables to eat. The agriculture lands are usually small and often a little bit patchy because of the non use of fertilizers. With this special view I felt very strange to find an electric pole in the middle of a field or an iron trafic sign just next to a gardening place. By the simplest intervention of painting and photographing on those objects I made them disappear in their landscapes and show the contradiction of the human interventions on the nature. Then I played with this idea by painting directly on natural elements and by this game, bring out the nonsenses of human interventions. "The garden's Thieves-trap" This sculpture is related to my first experience in SERDE . I was walking in some allotment gardens whene an angry guy came to scold me in latvian because he thought I was a thief. With the language difficulties it was hard to explain him that i was a french artist just looking for inspiration in those gardens. Finaly he anderstood me and I notice how important was gardens for latvians. It's not only a pleasefull place, it's also a true way of eating. For that reson they are very carefull of it and protect it again evry agretion! Consequently I made this huge trap to protect their gardens and catch thieves. Interdisciplinary art group SERDE's work and activity has been largely inspired by, and based upon these different aspects of cultural heritage noted above, and has included collaborations to explore human inter-relations with the local plant-environment and biodiversity. The following paragraphs give examples. 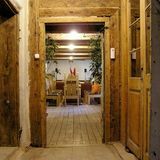 The site of SERDE's art and residency centre is one of the oldest wooden buildings in Aizpute, and has been restored since 2002 by SERDE as both practical and pedagogical work in traditional construction methods. This work alone was recently recognised as a significant contribution to regional tangible cultural heritage. One of the first material installations they made in the town in the early years was an outdoor kiln for firing ceramics, according local tradition. Since 2007 they have also hosted an iron-casting symposium gathering local and international sculptors and metal-workers. So, development of physical infrastructure and workshops for making artefacts and art objects – wood, metal, ceramic – have developed in hand with the practice and enabling traditions of making and doing, inviting younger and established artists and makers get involved. Further, the ways of doing of local people and regional ethnic communities, including narratives of experiences have been documented in artist-led ethnographic expeditions and published in the Tradīciju Burtnīca (Exercise/Notebooks of Traditions) publication series. To give examples of maker and project developments, the earliest publication Brandava gatavošana Viduskurzemē [Moonshine/vodka making in Central Kurzeme] and related public demonstrations led towards a national innovation award in intangible cultural heritage in 2007. This work inspired a practice-led investigation into micro-brewing with local producers (Alus gatavošana [Beer brewing], 2009), and the development of new workshop facilities, and hosting gatherings of regional micro-brewers. Another publication, Vācēju kultūra Viduskurzemē / Foraging in Central Kurzeme (2010), documented the use of local plants and fungi in the region, a reflection of the human value of the biodiversity in the region still appreciated by some residents. This led to the ongoing artistic-research project 1 Ha Aronia Melanocarpa Power Plantation (2011-) by Bartaku, in collaboration with SERDE, which harvested Aronia berries and processed them into liquids (wine, beer, syrup) and foods (candy, jam) according to traditional and experimental methods or recipes; but has also inspired an experimental musical overture presented in Riga Capital of Culture 2014 programme. assets, which are utilized to support and produce benefit, not only to individuals and associations, but larger communities such as municipalities, regions or wider groups of people. With this background in mind, the 'Cultural Heritage as Resource' event from September 10-13th 2015 in Aizpute gathers together persons from various disciplines - arts, design, science, heritage to share and explore practice and methods. It has long been said that culture is developed from some abundance or surplus in the society or environment. Coincidently, the occasion of gathering also takes place at the time of the annually-hosted Āboļošana (AppleThink) public event since 2012, where SERDE's residency artists and guests mix with local producers and craft-persons who share their products, both apple-based and otherwise. Apples (and Aronia berries) are an abundant local resource at this time of year and have associated traditions and ways of processing and conserving, for example juicing, preserving with sugar or fermenting to cider or wine. The gathering also takes place in the context of the HIAP-led 'Frontiers in Retreat' programme, which promotes the "necessity of multi-disciplinary approaches to the current ecological concerns and aims to develop means and platforms for this through methods of contemporary art". September 10 The day started by introductions the hosts (SERDE) and the Frontiers in Retreat framework (FiR) of gathering by Jenni Nurmenniemi from HIAP, followed then with a programme with art-science and non-human focus. The first part of the day included a history of RIXC research-led art investigations inbetween many fields by Rasa Smite; while yeast-researcher Janis Liepiņš spoke of his work with artist Gints Gabrāns in his postFOOOD project exploring alternative food solutions in collaboration with Acetobater xylinum bacteria; In-vitro biologist Anete Borodušķe followed with her collaborative research with FiR resident artist Bartaku and Ariona melanocarpa. After lunch, Bartaku shared a postcard-resume of his work in Aizpute with 1HAMP, the aronia plantation on the edge of town, leading to the opening of a temp. lab installation illustrating new growth. We all then went on a fieldtrip to the plants themselves for closer communion, insight and some cooperative harvesting. The evening was hosted kindly at Imants Lepsis's juicing-factory at Valtaiķi, with demonstrations of juicing, sterilisation and tasty consumptions inbetween dinner. September 11 Focused on cross-overs between artist-led cultural heritage work, social science and activism. It started with an introduction to the framework for NGOs working with UNESCO convention Intangible Cultural Heritage framework provided by Latvian Academy of Culture researcher Anita Vaivade. Signe Pucena (SERDE) and Andrew Gryf Paterson presented intuitive artist/heritage-activist-led heritage including participatory/collaborative documentatations about Herbologies, Kandža and Pig Funeral. Anna Karpenko, social scientist from Kaliningrad, shared with us the example of Соседи/Sąsiedzi/Kaimynai festival in Rominta forest, crossing-RU-PL-LT borders and ennobling local happiness. FiR artist Sylvia Grace Borda gave a whirlwind tour of her many projects which aim to add value and legacy to local economies and communities, including East Kilbride and Huntly in Scotland, as well as negotiating contemporary interventions of agriculture and animal husbandery onto GoogleStreetView in Canada and Finland. FiR resident artist Joanes Simon-Perret led us through his micro-garden allotments and multi-urban material weave installations, towards a walk to Dzintra and Ilmars' beautiful allotment Eden, where we uprooted the beetroot plot, harvested the pig-beans, and enjoyed a feast of sour-leaf soup, smoked chicken and salads. Later into the evening we visited Arturs Lapka, Jānis Kreicburgs initiative in town to transform an industrial sour-cabbage factory into a social and project space. September 12 Āboļošana (AppleThink) day, the art and craft market hosted by SERDE now for the 4th year, also included this year as part of Kultūras diena Aizputē (Aizpute Cultural Day). Although apples were the spark of inspiration, the backyard filled up with producers' tables and stalls, including: Free pancakes and fried-sugered apple by SERDE's Ance Ausmane and Ance Kvasnikova, a local piparkukas&pie table, plus a local wood-craft stall with toys and kitchen utensils, ceramics by Ieva Bertašiūtė-Grosbaha (iBerta), harvest-conservation demonstration by Una Smilgaine, Imants Lepsis's juices and antihelikon jam, Aizpute eco-winery (ekovins.lv) 's fruit wine-tasting table & apple-juicing machine, live singing by Atšaukas folklore group from Liepāja, aronia-berry shooting, a crazy professor act, demonstration of moonshine production, and T-shirt printing by youth house IDEJU MĀJA. Inside SERDE, a musical fairytale performance ("Rainis lielais bļāviens. Saules zaķēnu dejas!") by local children and adults took place. While after outside, SERDE's buildings were ceremonially added to the national heritage protection list (coincidently on European Heritage days 2015). FiR resident artist Anna Rubio Llambi made a creative-movement performance on/around, essentially in collaboration with the large tree that stands in the small park behind SERDE's workshop building, accompanied by piano improvisation from Rihards Plesanovs (She later explained her approach in presentation, showing other works). The festival-market atmosphere ended in the backyard with a 1-man/1-hour aronia mash-up in a barrel (functional dancing) to the sounds of tango-beats, blues and finally disco. Aizputes vīna darītava cellar under the town museum was the final stop for the FiR group, where Martins and Varis Sants offered further degustations and knowledge/experience sharing until darkness fell and animated chats bounced around louder and louder. Art Research Laboratory students of Liepaja University - Dāvids Gžibovskis, Kintija Simute, Kārlis Volkovskis, Gunta Dombrovska, Artūrs Kalvāns, Uldis Hasners, Maija Barbare, Marta Matuzeviča, Samanta Kalēja, Casper Gualgaard, Pauls Kūlis, Māra Vulfa, Linda Strauta, Dana Rasnača, Annija Gancone, Kristaps Strungs.